Spotinst makes it easy to manage your Spotinst accounts with the most popular identity providers. Let’s walk through how this integration works with Bitium. Select “Spotinst” from the list of installed apps. Copy the Relay State from Spotinst. Paste this into the SAML Relay State field in Bitium. 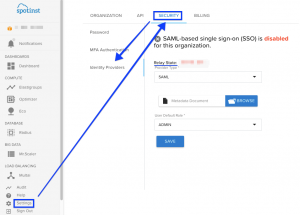 Ensure Provider Type is set to SAML. Download the Metadata XML from Bitium. Upload this into the Metadata Document field in Spotinst. Select the default role you wish new users to be created as in Spotinst. Click Save Changes in Bitium. You can now use Bitium!